Gail Spaien’s recent series of paintings, entitled Renegade Mirage, invites viewers to take the time to pause and gaze out at a world that is free from unpleasant things. As an anesthetic for extreme emotional experience, she paints her view as she would like it to be. In doing so she suggests her desire for, but also the impossibility of such idealized conditions. 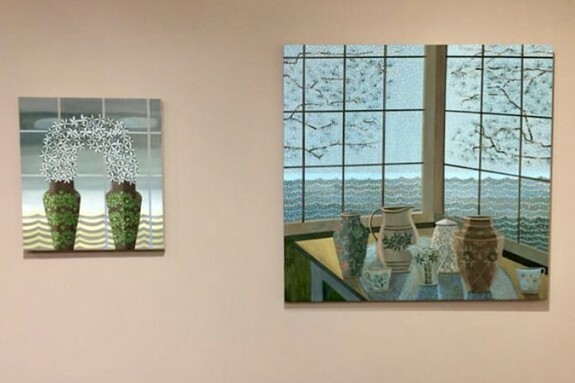 Chronicling the passage of time and the beauty of the landscape outside her studio window in the coastal New England neighborhood where she lives, Spaien unifies the content of her work around the cycles of nature and domestic activity. Visually translating the sensations of the world around her — air movement, the gravity of light, the fluttering of a flock of birds — Spaien’s paintings speak to the contradictions and poignancy of daily life and touch on themes of well-being and mortality, pleasure, loss and the balance of living. Like the Early American painters and Folk artists who recorded the world around them with naive, animated, and concentrated detail, delicate flora and fauna and elegant avian creatures inhabit a picturesque landscape. Spaien composes and layers on each painting with conscious echoes of the domestic practices of flower arranging, hand stitching and embroidery to create intentionally curated scenes. Her landscapes invite the viewer to experience a painting as both an image and a literal enactment of escape, one that holds an opportunity for renewal, physical intimacy and affective power. Gail Spaien is a Professor of painting and core faculty in the MFA program at the Maine College of Art, Spaien received her BFA from the University of Southern Maine and her MFA from the San Francisco Art Institute. She is affiliated with the Ellen Miller Gallery (formerly Miller Yezerski) in Boston and the George Marshall Store Gallery in Maine.